For some reason, I have three wooden stepladders. They proliferate while I’m not looking. 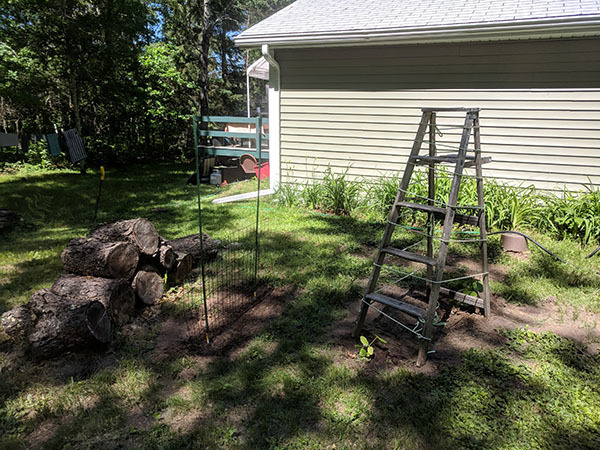 So, being that my motto is “Use what’s handy instead of buying stuff”, I used one of them as a trellis. The rope has been languishing in the shed for years, so I wrapped it around so the little acorn squash and cucumbers could use it to climb. The cucumber is a bush variety and since I haven’t grown cukes in years, I’m not sure of its growing habit. But as with all gardening, we’ll see what happens.